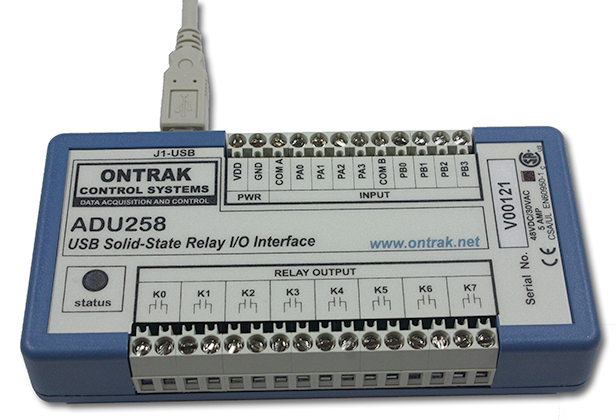 The ADU258 USB Solid-State Relay I/O Interface allows control of 8 SSR outputs, 8 contact or TTL inputs, and 8 event counters via a USB port. The ADU258 can effectively convert a standard PC to a powerful PLC (programmable logic controller). High quality PhotoMOS solid-state relays switch AC or DC loads. This low-cost serial relay contact interface is easy to use with VB, VB.NET, and Visual C++ via standard HID drivers included with Windows. A mini-driver (DLL) is also provided allowing control using standard ASCII commands using familiar readfile, writefile commands. The ADU258 includes a 10' USB cable and a flange mount enclosure. An optional DIN rail version is available. Download ADU258 3D STEP files for FLANGE, DIN and DESKTOP mounting types. Bus Powered, No external power supply required. Ideal for 5V, 12V, 24V, and 48V applications. High quality PhotoMOS relays switch AC or DC loads. High quality cage-clamp type terminal blocks. Meets IEC61000-4-2 ESD protection for USB port. Available as standard flange mount or optional DIN rail mount. IMPORTANT: Specify mounting option when ordering. -DESKTOP (Standard) -VELCRO, -FLANGE or -DIN . See Mounting Options for details.